In summer 1997 ZEF moved into a modern office building in the vicinity of many Federal Government offices and the Museums of Art ("Bonner Museumsmeile"). 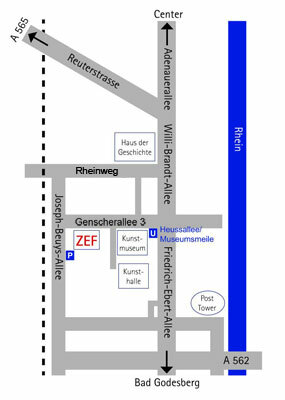 The building is located at Genscherallee 3 and can easily be reached with public transport. There is also a large parking lot for visitors at the rear of the building. From the Köln/Bonn airport, take airport shuttle bus SB60 to Bonn Hauptbahnhof (central station). From Bonn Hauptbahnhof, take subway line 16, 63 or 66 to Bad Godesberg or Bad Honnef, respectively, and get off at the 5th stop "Heussallee/Museumsmeile".